Twenty- and 50-round boxes of Littlestone Ammunition's loading of the 9mm+P Luger cartridge with Sierra Jacketed Hollow Point bullets. Hover cursor or click on photo for close-up view. Firearm not included. How to survive a gunfight? First, use absolutely reliable ammo. 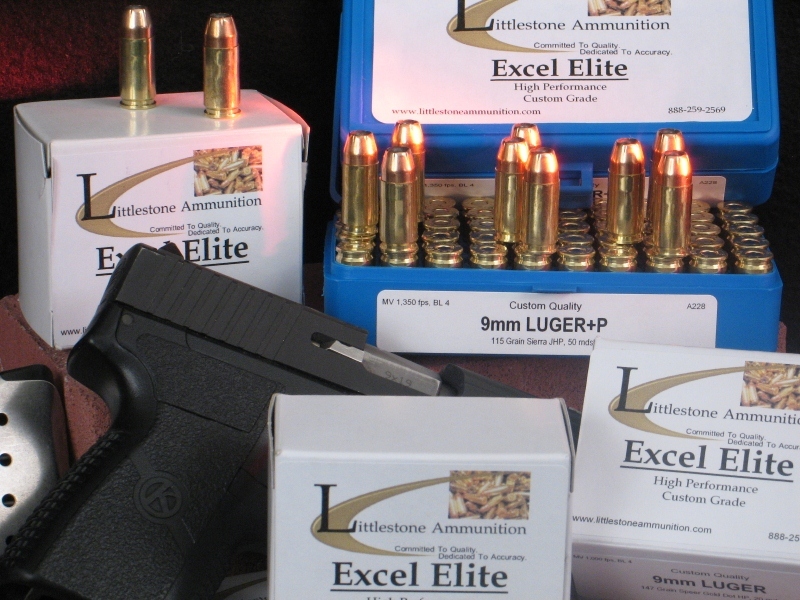 Littlestone Ammunition, offering reliability of true custom-quality consistency and quality control. Your 9mm+P Luger is only as good as the ammo you feed it, and the quality packed into this Littlestone Ammunition REALLY counts in your favor when your life is on the line. This 50-round box features 125-grain Sierra JHP bullets with a muzzle velocity of 1,200 fps and 400 ft pounds of energy. Sierra's jacketed hollow point has the widest opening at the tip of the bullet and a skived Power Jacket that extends to the bullet tip. The large opening and Power Jacket skiving assure unfailing expansion across a wide range of velocities, and all conditions and strike angles. It is designed to provide flawless feeding in all auto-loading pistols, as well as providing especially fast expansion at low to medium velocities. Feature 3: MV / Energy / Barrel: 1,200 fps / 40 ft lbs / 4"